Pack your bags for a relaxing lake retreat at this 4-bedroom, 3-bathroom North Liberty vacation rental house. This charming home boasts 2,700 square feet of living space, sleeping accommodations for 12 and a prime lakefront location on Coralville Lake. Enjoy the scenery from the wrap-around deck or walk just a couple of blocks down to the boat ramp. Home to numerous local gems, all of North Liberty’s greatest attractions will be within reach from this property. With all your essential comforts bundled with unbelievable lake views, this home will quickly become your ultimate home-away-from-home vacation house. Before stepping inside, make your way towards the back deck to take in the soothing waters and lush foliage that surrounds it. When you’re feeling hungry, head inside to whip up your favorite homemade meal in the fully equipped kitchen. Complete with all your essential appliances, this kitchen makes cooking for 10 easy as pie. After an action-packed day out and about, sprawl out on the sumptuous leather sofa in the living area. The space also includes a flat-screen cable TV so you won’t have to worry about missing your favorite show while away. If you’re feeling up for it, move the festivities to the downstairs family room for a game of ping pong or a drink at the wet bar. The room also comes equipped with a plush sectional sofa, flat-screen cable TV and doors that lead out onto the patio. Retire to the bedrooms when you’ve exhausted the day’s activities. The master bedroom comes complete with a king sized bed, flat-screen cable TV and en suite bathroom. 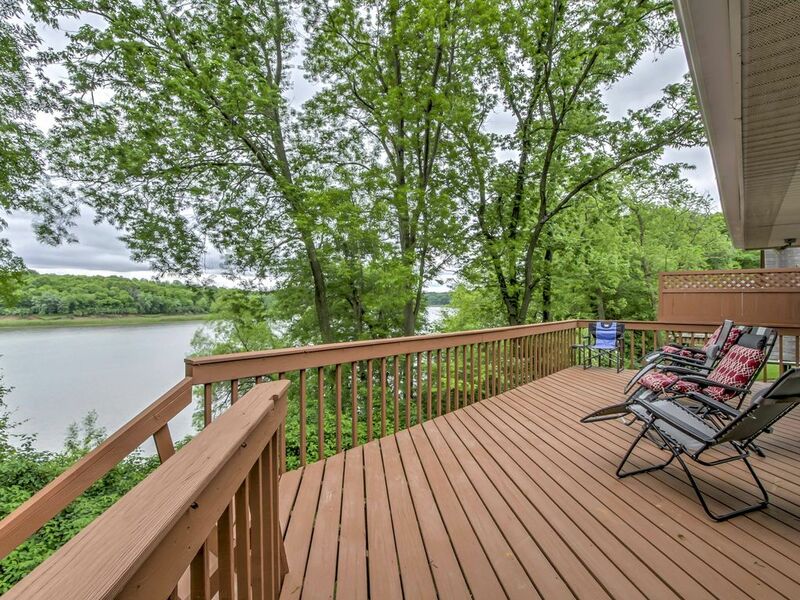 You won’t find a better place to explore North Liberty than from this lakefront property. Just a couple of blocks away from the boat ramp, walk on over to the dock and spend a day enjoying all the hidden wonders of Coralville Lake. If you choose to explore outside of the river, check out the outdoor patio at Red's Alehouse, located just 5 minutes away. Here, you will find a relaxing atmosphere and an assortment of over 150 microbrews. Salt Fork Kitchen is also nearby and offers locally sourced foods and a home-style atmosphere. Since Iowa City is only 20 minutes away, be sure to make the drive out and visit all the historical sites, fine restaurants and other local favorites, like Big Grove Brewery & Taproom and Hickory Hill Park. The University of Iowa is also 20 minutes away if you are coming to town to watch a Hawkeyes football game! - Amenities include a fully equipped kitchen, in-unit laundry machines, free WiFi, 3 flat-screen cable TVs, wet bar, ping-pong table, wrap-around deck, patio furniture and more! This was a great house for a family gathering. It was clean and spacious with a beautiful view of the river. The bald eagles and the cardinal were amazing to watch. Kimberly R.Where do you live? We had a girls weekend with 8 ladies who have been friends for 40+ yrs. The house was just as pictured. More than enough room for all of us to hang out together and plenty of beds for sleeping! Rick & Luan were amazing and very easy to be in touch with! Answered all questions very quickly! We all hope to make this a yearly event! Great location! This was the retreat we were hoping for. The house was perfect for our family, including our 18 month old grandchild. Plenty of room, toddler toys and books, with a gorgeous view. It was immaculate and easily slept 6 adults with an extra bedroom and 2 futons also available. We would absolutely recommend staying here! Great home with views of the river and enough room for everyone. In town for the Iowa vs iowa State football game so location was perfect (not too far from the stadium). Home had all the amenities to make our stay pleasant. We would definitely rent again in the future. This was a great place for my husband and I to vacation together with our grown daughters and their families. We had a great time playing games, fishing, shopping at the Amana Colonies, and just being together in one place! Everyone commented on how much they really liked this house - it was perfect in every way! And it had everything we needed . . . from the utensils, coffee maker, pots and pans, to cable TV, internet access, and a gas grill! We will request this house again for our next stay in the area. Wonderful clean, spacious lake home with beautiful scenery & great location! Beautiful home with a lake front view. Spacious and clean. Nice location near Lake MacBride. Owners were very accommodating and helpful.